Naples-based EBL Construction, in conjunction with EBL Interiors, has been selected to complete the interior renovations of a luxury condominium unit at The Biltmore at Bay Colony in Naples. 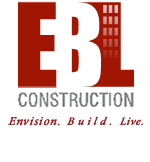 EBL Construction will complete all of the construction renovations required, from the installation of new flooring to electrical, plumbing and HVAC. EBL Interiors will be responsible for creating a stylistic kitchen design to include cabinetry, appliances, countertops, fixtures and more. EBL Construction’s experience profile includes the successful completion of projects in various sectors, including commercial, hospitality and residential. With a reputation for consistently meeting and exceeding the needs of their clients, the firm delivers unmatched build-out services and ensures the highest attention to detail at every stage of development. The company is currently engaged in projects in New York, Florida, Texas and Georgia. EBL Interiors provides design options for single- and multi-family residences, including new construction and renovation projects. The EBL Interiors showroom, open to the public and to the trade, recently opened in North Naples and offers products from premier European manufacturers including Snaidero, Vaghi, Biesse, Cotto D’Este, Miele, Franke, Steel Time and Max Fire, Farsetti Arte, EP Porte, EBE Porte and more. EBL Construction and EBL Interiors offices are located at 1482 Rail Head Boulevard, in Naples. For more information, call 239-431-5003 or visit www.EBLConstruction.com or www.EBLInteriors.com.